I have been asking around about the best way to carry my son. At eleven months he is a chunk at 27lb and the stretchy wrap we had for those early days is tending to droop now with his weight. Everyone had different recommendations as there are so many choices out there but the idea of the ERGO carrier stood out. A soft structured carrier, the ERGO carrier is more dad friendly than a wrap and more comfortable for baby than many other structured carriers. The carrier consists of a soft panel, padded waist and shoulder straps and a handy sleep hood to stop little heads from rolling back. It can be worn on your front, back or hip and there is a seperate newborn insert which can be purchased making the carrier suitable from 7lb to 44lb! I was still dubious about how comfortable it would be considering the size of Dylan but decided to jump straight in and wear it for a day out at Wingham Wildlife Park. That meant four hours of baby on my front or back (haven't attempted a hip carry yet) but that is what I want from a sling - the comfort to wear it all day. Luckily it didn't dissapoint. I wore him comfortably and at the end of the day could still have carried on for longer. The straps spread his weight throughout my body making him feel so much lighter than usual! He loved being carried on my back as he could see everything I could. He had no problems seeing into all the enclosures whereas in the buggy he may not have seen over the fences. When he got sleepy I had him on my front as I did find putting the sleep hood on from behind a little tricky. It kept his head comfy and sheltered and he happily napped cuddling me! I was really impressed with the carrier and have been putting it to the test rather a lot lately! I find it so much easier to pop him on my back for a short trip or going to the beach than to pack up and strap him into a pushchair and we can chat as we walk. I point out cars, flowers and people to him and we can have our own private conversation as his head is up by mine. 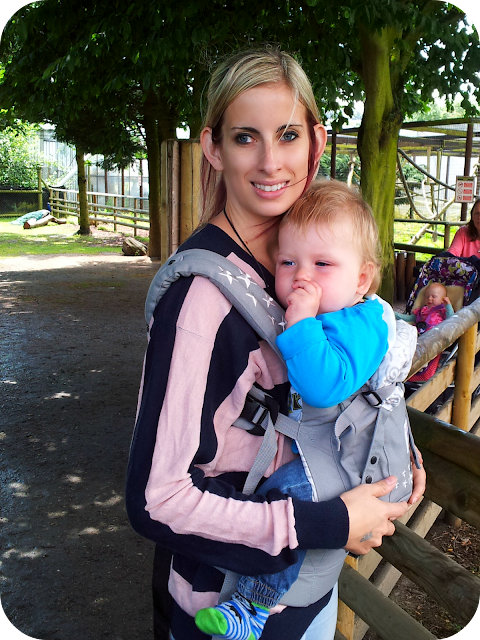 I am absolutely loving my ERGO carrier and would recommend them to anyone who wants to carry their baby or toddler. Suitable from birth to 4 years they are perfect for both long or short journeys and really distribute the weight well. So much better for your posture than carrying a child on your hip for long periods of time and 'daddy friendly too'. They come in a range of gorgeous designs although my favourite is still the galaxy grey that we have tested, make sure you purchase them from an approved supplier though. They retail for around £90 which I think is great value as they last for a several years and hold a high resale value. Disclaimer: We were sent an ERGO carrier for the purpose of this review but all thoughts, words and photos are my own. I found the side carriers got very heavy very fast - I would definitely recommend this one though! Eek I just ordered one last night! So excited. I sadly ordered from a fake site a few weeks ago and so had to order again yesterday from a reputable retailer. We had a sling for when she was really little and then a comfort carrier but she felt too heavy by 9 months for them. Ohh exciting! Hope you get on well with it! Haven't tried the Boba but I am in love with my ERGO now! We've got the same one and absolutely love it. I bought it when little miss was about 7 months because she was starting to droop a bit in the stretchy sling and we're still using it regularly now and she'll be two in September. We've taken two weekend breaks to London with no wheels using just the ergo and until recently she traveled to and from nursery in it every day (so much easier to store there than a buggy!). I've never worked out the hip carry so do share if you every figure it out! We did go to the Olympics with ours! And thank goodness. I have 3 under 4 and so it is an absolute godsend. I tend to have oldest walking, tiny in buggy and middle on my back. Sometimes I even have a spare hand :-) Completely rate ergos. Really excellent value for money. I bet it was a gods end! Great to hear I am not the only one who loves the ERGO and I think it will be invaluable when Squish comes along! We love the ergo carrier. It has been on many adventures with my two little ones and still looks great. I love that it is machine washable and comes in so many great colors! A huge perk - it is Dad friendly! My husband loves to wear it! The smoker can choose his flavor and enjoy smoking until the cartridge runs out of e-liquid. Apart from this, people find excue to their smoking. Athens concluded some research tthat shouod deter many people away rom vapor cigarettes and onto other means of quitting. The initiative complements our Asbestos Timebomb petition for Number Ten. Appearing on CNN's" State of the Union address in late January, but Manu Raju, a reporter for the Politico website, told Al Jazeera. Can the Cypriot government find a way to resolve the crisis in the north. As a side note, the idea of using egg cartons is pretty much useless, I've been told. Usa is a tremendous 93 percent. Here is my homepage http://doc.magenkit.com/index.php/Learn_How_To_Beat_The_Slot_machine. have the cash or desire to continue playing these equipments. for each friend you welcome! apply forex trading with real-time knowledge. items and forex market ().